Popping by from the author blog hop! I like you guys - that's why I join in. I've finally figured out how to follow you now. Phew! Lovely pictures of St. Andrews on your blog - and it's strange actually seeing the faces of people you read about on the net (I mean Megan). It's also nice because now I can picture her. Hello Sue! 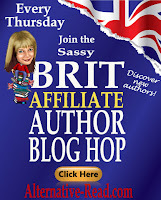 I' stopping by for the Blog Hop. I'm subscribed via Google, so that I can get all of your blog updates now. I'll follow you the same way - great to meet you.